← His Enchantress By Diana Cosby — I was enchanted! Another winner from Courtney Milan! About The Story: Violet Waterfield, the Countess of Cambury, a widow with a brilliant mind was born during the time that women could and should not be brilliant. Many women who were, hid behind their husbands and let them take credit for any kind of invention or discovery. Unfortunately, Violet also believed herself ugly, selfish, unlovable and not needed. Nor could she stand to have a person touch her, not after the way her deceased husband had abused her. She preferred to be lost in a crowd, to just disappear, but her need to give the world her discoveries set her to have her best friend, Sebastian, work alongside her for five years learning about her research. He then presented lectures about her discoveries as his own. Sebastian Malheur was always lacking. His older brother belittled any accomplishment that Sebastian did and because Sebastian loved his brother and respected him, he believed that he just wasn’t able to do the right thing, although he tried very hard. He was able to make people smile, to make them laugh, but was that enough accomplishment? Apparently not, for his brother. He had serious issues with taking credit publically for Violet’s scientific work. When his brother was dying of a weak heart Sebastian asked him to let him be his son’s ward. His brother refused. Sebastian set out to show his brother that he was better than he thought and with surprising results. 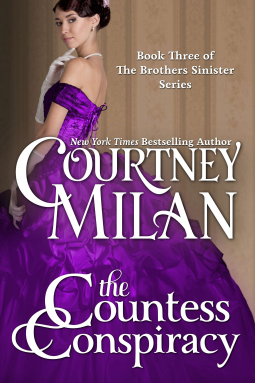 My Thoughts: Courtney Milan always brings more to her novels than just a good story. She is able to expose the issues of the day when women were fighting for equality in education, and their acceptance of their contributions in sciences. This story also highlights that true friendship is one of giving and not asking to get. Violet’s journey through the story taught her how to love herself, to discover that she was lovable and to realize what real love is. Sebastian is every woman’s dream—you are sure to fall in love! It is a sweet love story with a woman who has found her strength and a man who has earned her love. This entry was posted in Book Reviews and tagged Book Review, Courtney Milan, historical romance, The Countess Conspiracy. Bookmark the permalink.